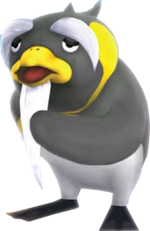 Penguru is an elderly penguin that appears in the games Super Mario Galaxy and Super Mario Galaxy 2 as a helpful NPC. His name is a play on words of "penguin" and "guru". Penguru appears in the Drip Drop Galaxy, the Bigmouth Galaxy, the Sea Slide Galaxy and the Grand Finale Galaxy in this game. In the Drip Drop Galaxy, Penguru and several other penguins (of whom he is apparently the grandfather) appear on an island. They are distressed about the outbreak of Gringills (referred to as "Giant Eels" in the level name). He requests that Mario get rid of them and awards him with a Power Star when he does. Penguru's home is in the Sea Slide Galaxy on an egg-shaped island known as "Penguru's Place". He is the keeper of one of the five Silver Stars that Mario has to collect in the Sea Slide Galaxy as well. Penguru makes small appearances in the other two galaxies he appears in. In the Bigmouth Galaxy Penguru will appear at the beginning and tell Mario where to go. He often goes to the Bigmouth Galaxy to relax and think. Penguru's final appearance in Super Mario Galaxy is in the Grand Finale Galaxy where he is seen gazing up at Princess Peach's Castle. Penguru reappears in Super Mario Galaxy 2 in only two galaxies, the Hightail Falls Galaxy and the Cosmic Cove Galaxy along with his fellow penguins. In the Hightail Falls Galaxy, he is at the top of the large ramp and congratulates Mario and Yoshi for getting up there when they do. In the Cosmic Cove Galaxy, he is seen standing on top of a platform near the waterfalls and appears in all levels. In the first level, he gives a helpful tip on how to get the star, and in the second one, he tells Mario about the twin falls. This page was last edited on February 18, 2018, at 19:22.